Dávila, Julio D (ed), 2013, Urban mobility and poverty: Lessons from Medellín and Soacha, Colombia, London: DPU, UCL and Universidad Nacional de Colombia. Dávila, Julio D. (comp. ), 2012, Movilidad Urbana y Pobreza: Aprendizajes de Medellín y Soacha, Colombia, Londres: DPU, UCL y Universidad Nacional de Colombia. Urbanisation and globalisation have brought with them a number of challenges. The world’s population and productive activities are increasingly concentrated in cities. At the same time, disparities in income continue to rise around the world, especially in emerging economies where wealth is concentrated in ever-smaller groups. Add to this the challenges of climate change, and the need to sustainably plan and manage urban spaces, which are today larger, more diverse and more fragmented than ever before, becomes of paramount importance. A small but growing number of cities in the Global South have successfully taken up the challenge of planning and managing urban spaces under principles of equity and sustainability. Medellín, Colombia’s second city, has emerged as an example of a set of urban interventions seeking to redress deep and long-standing social and spatial imbalances. It has done so through the use of imagination, audacity and systematic, collaborative work with communities, whilst strengthening its municipal revenue base and maintaining public ownership of key assets. This book examines the experience of Medellín in seeking to reduce poverty and integrate large marginalised areas, marked by years of severe poverty and violence, into the urban fabric. It pays particular attention to the impact of two aerial cable-cars connecting high density hilly neighbourhoods with the rest of the city, and an associated urban upgrading programme. It also contrasts Medellín’s successful experience with that of Soacha, a municipality adjacent to Bogotá, Colombia’s capital city, where an aerial cable-car has been proposed as a means of linking two low-income hilly neighbourhoods with a main arterial road. The contrast between a well-resourced, well-managed municipality like Medellín with a dense and homogenously poor and institutionally weak municipality like Soacha offers valuable lessons to other cities in Latin America and elsewhere. Contributions draw from a two-year research project coordinated by the Development Planning Unit, University College London (UCL), in conjunction with Universidad Nacional de Colombia (Medellín campus) and Universidad de los Andes in Bogotá. 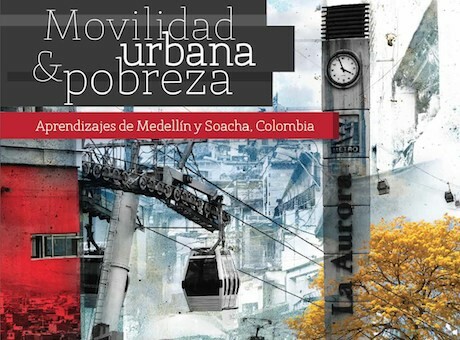 In addition to the detailed case studies of Medellín and Soacha, the book also brings together cases in Latin America where aerial cable-cars have either been built or proposed in low-income neighbourhoods, including Caracas and Rio de Janeiro. This book is an invaluable resource for academics, urban professionals and advisors to municipal and national governments in transport, urban development and social development.